Anyone reading a newspaper in the days following the 4th of July, 1947, would probably have noticed something odd: There were suddenly a lot of stories from all over the nation about sightings of “flying saucers” or “flying disks.” The Marion Star carried these stories, most of them coming in from the major news agencies, but more interestingly (at least for readers of Spooky Marion), the Star also ran a few stories about UFO sightings in the Marion area. Two Marion residents were added today to the growing number of persons who reported seeing the “flying saucers.” They are the first to report from this locality. Mr. and Mrs. Earl Huntsman of 175 Pearl Street reported they saw a number of disks Friday night about 10:30 while driving near Iberia on their return home from Galion. They said the disks were high in the sky and when they passed over clouds, a reflection was cast from the disks. The said the disks were round, did not seem to be going in a definite direction but would fly back and forth, looking like lights in the sky. By the next day, even more Marion County residents came forward claiming they had seen flying saucers. J.W. Campbell, president of the Campbell National bank at LaRue, and his assistant, Orville Boblenz, saw the saucers about 10:30 Friday night, Mr. Campbell said today. The two were about five miles apart when they noticed the unusual performance of what they took to be reflections in the sky. Mr. Campbell explained that he was driving home from Morral when he saw the lights shining in front of his automobile. After he discovered it was not a reflection from lights of a car behind him, he got out of the car, thinking there must be some birds flying low in front of his auto. When he saw the “things” from the outside, they appeared to be reflections in the sky, he said. “They were about two feet long and very thin,” Mr. Campbell said. “There must have been two or three of them. They were travelling very rapidly in the sky and seemed to be circling back and forth, first bright then disappearing. I watched them for about three miles while I was driving south. Then a black cloud came across the moon, and they disappeared. They seemed to be very distant in the sky. I believe they were reflections of some kind. Mr. Campbell said the saucers resembled reflections from a light but that there was no beam leading to them. He hesitated to mention his experiences, he said, because he had heard no one else talk of the saucers. At the time he had not read any accounts of the appearance of “flying saucers” over the county. When Mr. Boblenz also mentioned seeing them at the same time, Mr. Campbell was convinced his eyes were not playing tricks on him. After discovering that the saucers have gained nationwide attention, Mr. Campbell said he has kept an eye to the sky for the past several nights in hopes of seeing more, but nothing has appeared. If one considers the dates and times, it appears that the Huntsman couple and Mr. Campbell and Mr. Boblenz saw the same UFO. Naturally, the question is Why was there suddenly a huge increase in the number of UFO sightings in such a short amount of time? If one ignores the most obvious (but least likely) scenario – namely, that people were really seeing flying saucers – there are a few other possible explanations for the surge in UFO sightings. 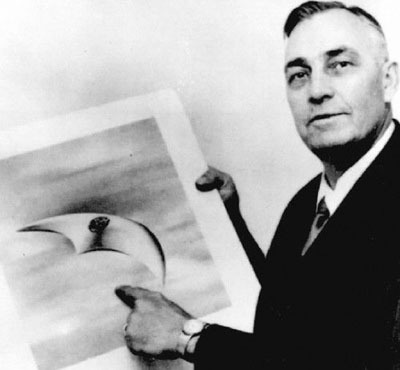 Kenneth Arnold with a drawing of the UFO he allegedly saw. To add to the hubbub, just as UFO sightings were peaking, the Roswell Incident occurred. In an Associated Press story appearing on July 8th, public information officer Lt. Walter Haught made this shocking announcement: “The many rumors regarding the flying disc became a reality yesterday when the intelligence office of the 509th Bomb Group of the Eighth Air Force, Roswell Army Air Field, was fortunate enough to gain possession of a disc through the cooperation of one of the local ranchers and the sheriffs office of Chavez County.” Unsurprisingly, the media interest in the story was intense. However, in his Report on the UFO Wave of 1947, author Ted Bloecher writes that many people were increasingly treating reports of UFOs with skepticism and even outright derision. Embarrassed by Haught’s statements about the Roswell crash to the press, the Commanding General of the Eighth Air Force stated on July 9th that, in fact, a radar-tracking balloon had been recovered by the RAAF personnel and not a “flying disc.” By July 11th, news of flying saucers was no longer front page news (at least in Marion). Something akin to a flying saucer was observed by Marion residents in the sky Thursday evening just before sundown. The object, which seemed to be cloudlike, was described as elongated in shape, with a dark substance at the front of it. Moving slowly in the western sky, it curved to the right and took off in a southerly direction. The object remained visible for some time the observer reported. And in this fashion the UFO sightings continued, in fits and starts, through the 50s and 60s. It wasn’t until the early 1970s that another rash of sightings occurred, and again Marion played a small role in it. But that’s a Spooky Marion story for another day. I was abducted by aliens once, and it was incredible. Their UFO mothership had so many lights. I’ve got a picture of it around here somewhere.